Who wouldn't need a cocktail? Enter the players. There were seven of us then, seven bright young things with wide precious futures ahead of us. Until that year, we saw no further than the books in front of our faces. We, here at The Attic on Eighth, love a good novel that delves into the literary canon, plays with what we know, and then produces something of great value that’s all its own. M.L. Rio’s debut novel, If We Were Villains is just that. Dipping in and out of the present, IWWV tells the story of seven young Shakespearean actors who are faced with violence. The novel plays with the prose, borrows from theater, and creates a compelling story of drama, crime, lust, and friendship. As the author is a friend of ours, we decided that we would do something a little different in addressing If We Were Villains. In case you've missed it, Culture Editor Eliza (A True Theater Kid & Literature Student) and Beauty Editor Rory (Who Could Have Been an Early Modernist) have reviewed the novel through a series of text messages. And for this month's Drink Column, I (A Certified Lover of Drama) offer a recipe inspired by the novel. I honestly do not even know where to begin with my love for campus novels. Or campus films. Or shows. Or inspired fashion editorials. It probably stems from my love for academia, but growing up there was at least one occasion a month where I became physically upset at my lack of a school uniform requirement (shocking, I know, that an eccentric girl would crave some order), and delving into the campus genre let me live out my fantasies. Aside from the description of gold ballet flats and plaid navy skirts, the debaucherous lifestyle led by the characters in these stories also had its fantastical appeal. Living a sheltered, straight laced life, I was fascinated by the dramatic messes these kids would get themselves into, with a gin martini in hand and still somehow cognizant enough to make that 8am lecture presentation. The mention of alcohol use in novels is a niche topic that interests me. A character’s choice drink is never a coincidence, nor is the amount they may consume at any given moment. The casual toss in may be of interest as well, be it to lighten the mood, or set a scene. I can't think of a more underrated moment in literature than Francis Abernathy drinking champagne out of a teapot, as irrelevant as it may be to the entire rest of The Secret History. In dramatic iterations, however, it can mean so much more. It can slowly build a moment, or be the final straw which leads to the climax. 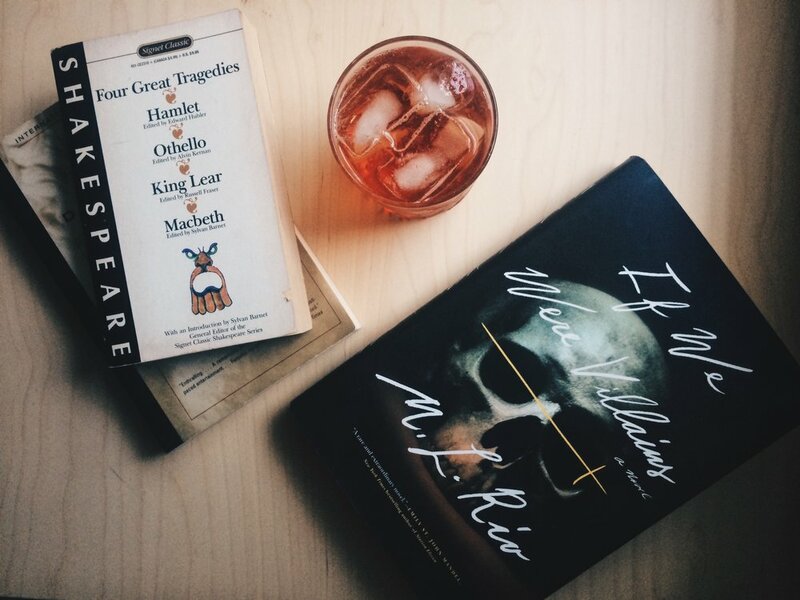 Thinking back on If We Were Villains, certain moments tie together—the countless glasses of wine strewn about during late night study sessions were a personal favorite, reminding me of my own campus days, but the characters’ connections struck me most. Wren, in her earnest purity, swaying back and forth, whiskey in hand... Meredith, and a necessity for olives I can only describe as iconic. A girl drinking out of a proper glass in a party full of solo cups will always have my heart. James, James... The mere thought of James and anything vodka related makes me want to cry. With such a varied usage of preferred drinks in IWWV, I found myself inundated with possibility. I went through various ideas, some even based on cocktails originating from the northeast, but the thought of choosing any particular base made it feel as though I would be playing favorites, and I love each and every one of those six disasters with all of my heart. (Sorry, but I think we all know which one I'm leaving out.) I did, however, have one request from Rory, that given the novel’s Shakespearean origins, when it came to this cocktail, there be blood. That I could work with. We all know I live for puns, so I give you The Friendly Betrayal. In a rocks glass filled with ice, pour in the bourbon and bitters, stir until cold. Slowly drizzle the grenadine over it to create a layered effect, following with the lemon juice. Top off with the ginger ale, give it another light stir and enjoy! I've chosen to use bourbon, because, well, I guess I do play favorites, but whiskey will do as well, and I've used specialty bitters but any citrus bitters you can find will do, and feel free to adjust your drops to taste. The thing I love about this drink is that it tastes like a Shirley Temple, but hits you sooner than you'd think. It’s also how I'd probably describe that last, breathless scene, so it only seems fitting that I go mix myself another and run off to re-read it. To your health, my friends. And don't forget, next up, we’ve got an interview with M.L. Rio herself. Stay tuned!